(CNN) -- Britain's Prince William is to attend tonight's Champions League final between Manchester United and Barcelona in Rome, in his capacity as President of the English Football Association (FA). 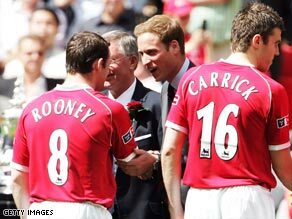 Prince William will re-acquaint himself with Manchester United's players in Rome on Wednesday night. The prince, second in line to the British throne, will meet key officials and other dignitaries in private before the match, during half-time and then after the match. The prince will be accompanied by senior English FA officials, including chairman, Lord Triesman. King Juan Carlos of Spain will also attend the match in support of Barcelona and prince William will be granted an audience with The King before the match. But what makes this football match so important that the royal families of both competing nations should want to be in attendance, when they can view proceedings from the comfort of their sumptuous sofas. Well, put in simple terms, the Champions League final is the biggest, most watched and most eagerly-anticipated club match in the world. It is the climax of a season-long competition, which starts the previous summer and ends 10 months later with the traditional culmination of the football season. The Champions League is the pinnacle of European club football and has historically pitted the who's-who of all the greatest teams and players in football together. In the past, the European Cup was simply a competition which saw all the champions of the domestic European leagues facing each other in a knock-out cup format. Ronaldo or Messi - who's the greatest? But since European governing body UEFA altered the format in 1992, and renamed the competition 'the Champions League' to also incorporate second, third and, in some cases, fourth placed terms from their respective domestic leagues, the world-wide interest, profile and TV revenue the competition generates has reached new and unparallelled heights. Although tradionalists and critics claim that the new format can sometimes mean a club becomes champions of Europe, without being champions in their own country, this argument definitely cannot be aimed at the 2009 final. Manchester United are the champions of England, Barcelona are the champions of Spain and, by common consensus, the English Premier League and Spanish Primera Liga are the two most glamorous leagues in European football. Therefore, organizers UEFA have achieved what they always hope to achieve, the two champions, of the greatest leagues in Europe, locking horns in the final of the most watched club match in world football. They have got their "dream final." And that is why Prince William and King Juan Carlos will be in attendance. They will be watching the best players in the world, playing in the greatest match in the world, from the best seats in the house. Now, who would refuse that offer?